LONDON, UK, August 26, 2013 (ENS) – British Prime Minister David Cameron has launched a nationwide drive to promote cycling in cities and national parks across England. More bikes on the road will mean fewer cars, less air pollution and a reduction in greenhouse gas emissions. Considering both national and local contributions, new funding for upgrades that will help cyclists will be worth a total of £148 million (US$230.4 million) between now and 2015. A total of £77 million will be divided between Manchester, Leeds, Birmingham, Newcastle, Bristol, Cambridge, Oxford and Norwich. This funding means that investment in cycling in the eight cities is now in excess of £10 per person per year, as recommended by the All Party Parliamentary Cycling Group’s recent report. New Forest, Peak District, South Downs and Dartmoor will each share a slice of £17 million funding for national parks. In Greater Manchester, for instance, Department for Transport funding of £20 million paired with a local contribution of £11.1 million will kick start Velocity 2025, which will, over time, create a city-wide cycle network. This will involve a series of high quality cycle lanes that will lead from the city center out to the M60 like spokes of a bicycle wheel. Spokes will have a Cycle and Ride station located several miles from the city center, allowing cyclists to leave their bikes and swap onto Metrolink or a local rail service for the last leg of their journey if they wish. As part of a door-to-door approach the proposals involve the introduction of 20 mph zones in some residential areas adjacent to the cycle “spokes” to enable safer access to the cycleways. Greater Manchester’s vision is to double the number of cycle journeys within five years and to double them again by 2025. The government funding will bring 56 kilometers of new or improved cycle paths and predicted health and wellbeing savings of around £7 million a year. “This government wants to make it easier and safer for people who already cycle as well as encouraging far more people to take it up and business, local government, developers, road users and the transport sector all have a role to play in helping to achieve this,” Cameron said while announcing the new funding August 12. Cameron said government has plans to cut red tape that can stifle cycle-friendly road design and to encourage changes to the way roads are built or altered. Local councils will be expected to deliver infrastructure that takes cycling into account from the design stage. New plans for major roads that have a significant impact on cyclists, such as junction improvements or road-widening, will be cycle-proofed so they can be navigated confidently by the average cyclist. Junction upgrades and other improvements will help cyclists at 14 locations on the trunk road network where major roads can prove an obstacle for journeys by bike. £5 million will be invested in upgrades this year and a further £15 million will be invested in 2015 to 2016, with plans in place for many more similar schemes. This commitment to improved cycling facilities is intended to put Britain on a level-footing with countries known for higher levels of cycling like Germany, Denmark and the Netherlands. Currently, only two percent of trips in the UK are made by bike, compared with 14 percent in Germany and almost a third in the Netherlands. This is despite the fact that 43 percent of people own or have access to a bike in Britain, and 38 percent of people could just as easily cycle for short trips as use a car. In the United Kingdom the National Cycle Network already offers 5,000 miles of continuous routes, including traffic-free and traffic-calmed sections, and minor roads. The Network carries an estimated 100 million journeys every year. But there are wide variations in levels of cycling across the UK. For example, 47 percent of adults in Cambridge cycle at least once a week, compared with fewer than five percent in other areas. 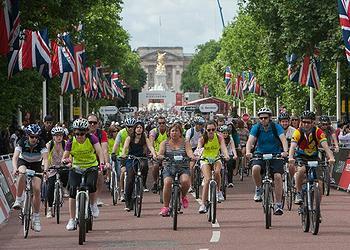 Earlier this month thousands of cyclists took over London streets, which were closed off to cars for the Prudential RideLondon festival weekend, the UK’s largest cycling festival. 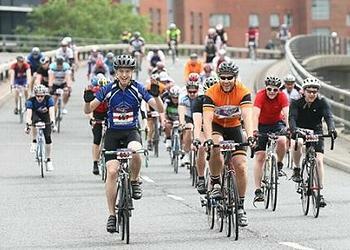 Cyclists enjoyed an eight-mile traffic-free route past many of London’s most famous landmarks. Prime Minister Cameron also announced a study that will look into creating a new national cycleway broadly following the route of the HS2 rail line from London to Birmingham, Leeds and Manchester. It would link communities and rail stations to work, schools and shops as well as countryside and tourist attractions along the way. Cameron said the government will create a new national School Awards Scheme to recognize schools that have demonstrated excellence in supporting cycling and walking. The UK cycle industry, led by the Bicycle Association, has volunteered to work with government to sponsor these awards. In addition, the government is extending its commitment to support Bikeability cycle training into 2015 to 2016. Offered by the Department for Transport, Bikeability training sessions will will have reached more than 1.5 million young cyclists by March 2015. The central government is currently working with highway authorities to trial a host of measures to improve roads for cyclists that include mini-signals at cyclists’ eye height to give more targeted information to cyclists and the possibility of a head start at junctions along with filter signals for cyclists as an alternative way of providing a head start at traffic lights. There are also trials of different roundabout designs to reduce the speed of vehicles to provide a safer route for cyclists and options for larger advanced stop lines, to accommodate the growth in cycling and make it safer for cyclists at junctions. Further work is underway to make it even easier for councils to install mandatory cycle lanes and contraflow cycle lanes, cutting costs and complexity for councils. The Department for Transport is also arranging a conference in the autumn aiming to encourage local authorities to deliver better cycle infrastructure. Statistics published by Sport England show that the number of people cycling for sport and leisure has increased by 231,300 since 2005 to 2006, when London won the bid to host the Olympic Games.